About halfway through The Tempest at Pittsburgh Public Theater, I started jotting various words or phrases on my notepad as the characters spoke them. They struck me as odd. And soon it became clear that this production of Shakespeare’s classic is new and unusual in even more ways than I had expected. How much you like the play, overall, may depend to a very large degree on what you like. But it’s definitely a “statement” play. This is the first show directed, hands-on, by The Public’s new artistic director, Marya Sea Kaminski, who also adapted Shakespeare’s script. The statement she makes is that The Public—one of the city’s oldest and largest companies—is likely to do a lot of experimenting while she’s in charge. Let’s look at what Kaminski has done with The Tempest, a strange play in its own right. Her four principal experiments make for an intriguing case study in the art of adapting Shakespeare. In Shakespeare’s original, nearly all the characters are men. In Kaminski’s cast, all the actors are women or trans/non-binary. Experimentation score: above average. Some notable modern productions have had the lead role, Prospero, played by a woman as a woman. This one goes all the way and then some, blurring standard male-female gender identities in the process. 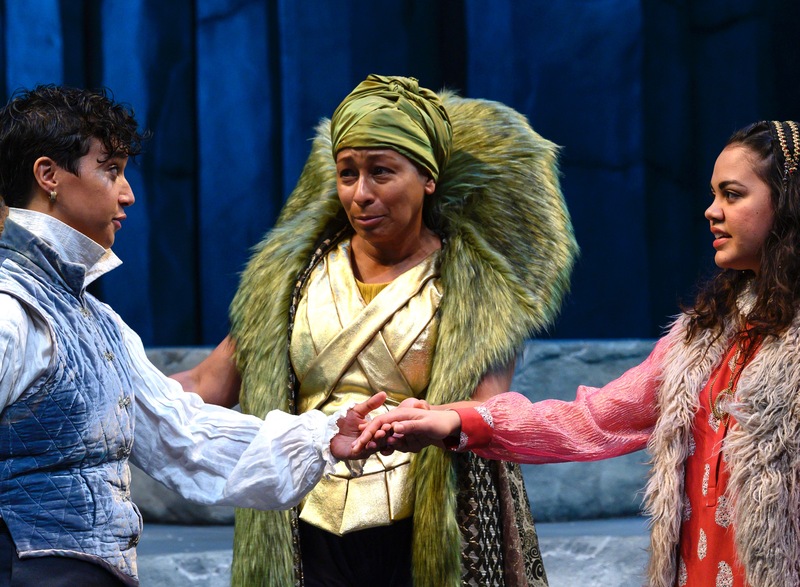 For instance, The Public has Tamara Tunie explicitly playing Prospero as a woman. I think. But a number of other characters could be taken either as women playing men, or as something else. And how well does this work? All good. It doesn’t feel forced. It just is what it is, and it makes old men think, which is always a good idea. A quick plot check is needed here. Shakespeare set The Tempest on a remote island where Prospero, the rightful Duke of Milan, has lived in near-isolation since his bad brother usurped him. Prospero has acquired magical powers, plus dominion over the island’s two native creatures—a supernatural sprite, Ariel, and the ungainly semi-human Caliban, spawn of a now-deceased witch. The action begins when Prospero conjures a storm that drives ashore a ship carrying none other than the bad brother, plus said brother’s fellow travelers. Prospero and his minion Ariel magically tease and torment the new arrivals, even as they try assorted power-grab schemes of their own. Homicide is prevented when Ariel, wearing an enchanted hoodie, magically intervenes. Wicked Sebastian (left) is played by Aryana Sedarati, Ariel by Janelle Velasquez, and good Gonzalo by Laurie Klatscher. Then, magnanimously, Prospero forgives all who have wronged him. He marries off his daughter Miranda (who’d been his sole human companion in exile) to a nice young man from the ship, prince Ferdinand, and all prepare to head home at last. The whole weird play is open to multiple symbolic interpretations, which scholars love to debate. For The Public, Kaminski bookends the tale with another. Her Tempest opens in a modern-day hospital room, where actor Tunie is a cancer patient in terminal condition. Lying wearily abed, she must tolerate the bustle unfolding around her—hospital staff coming and going, relatives popping in to visit all too briefly, and so on (this is played out silently by the actors, in swift pantomime). Left alone, the patient slips into a dream state. Accompanied by dazzling effects, she imagines herself onto the island where she becomes Prospero. And then Shakespeare’s The Tempest begins—until, at the end, we’ve got “Prospero” dying back in her hospital room. Experimentation score: skillful surgery, minimally invasive. Many adaptations of The Tempest have really messed with the core story. An early one, in 1667, added new characters and raunchy sexual innuendo. Other versions in recent times have bent things around to deliver socio-political messages, show off a big artistic idea, or whatever. 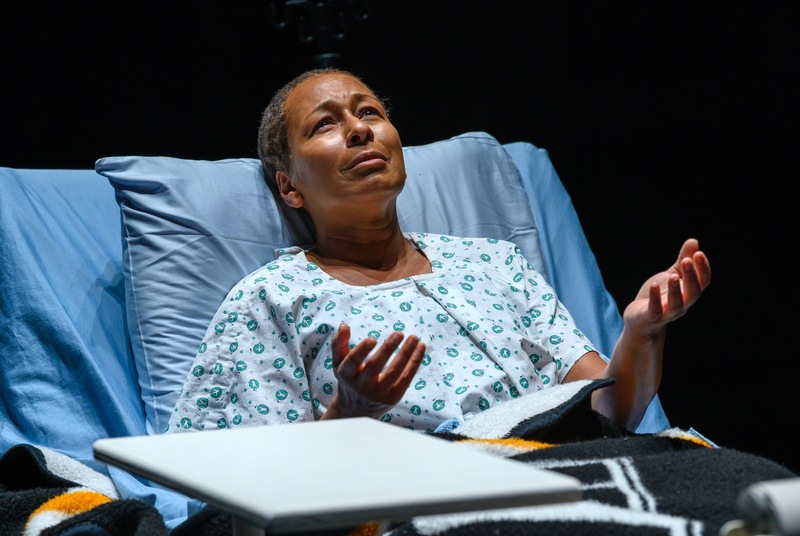 Kaminski’s hospital treatment is applied deftly at the play’s edges rather than attempting a heart transplant. How well does it work? Sure works for me. In only a few minutes, the new opening vividly captures what it’s like to be confined in a hospital. (I’ve been there, though with a happier outcome.) During the space/time transition from patient-in-room to Prospero-on-island, the effects are marvelous. Silvery-white snowflakes descending in the air outside the room become like sparkly fairy dust, while the center of the stage floor slowly rotates to hide the hospital setting and take us to a new land. As life’s great curtain call draws near, Prospero sees the light. Further, the hospital concept fits well with one possible reading of The Tempest. In the original, Prospero admits that he is old and “infirm,” and is having thoughts of his eventual demise. With the new scenes that frame Prospero as a dying patient, the play becomes a parable of acceptance and reconciliation near life’s end. Shakespeare’s plays are wordy and complex. Thus it’s quite common to shave Shakespeare down a little … or in some cases, plenty. I went to the theater ready for a stay of two and a half to three hours. Kaminski’s Tempest runs 1:45, with no intermission. Experimentation score: more than just a trim. I’ve been to Shakespeare plays that had major cuts, notably Love’s Labour’s Lost. But that’s a super-long one if done in full, whereas The Tempest starts off as one of Shakespeare’s shortest. How well does the cut-down work? OK, I guess. Kaminski has eliminated some minor characters and their scenes, such as a couple of attendant lords. Not sure where else the cuts were made, and I can’t tell without scientific comparison how this version would stack up against a fuller one. About those words I was jotting down: Nowhere does Shakespeare’s script use terms like “hurry up,” or “up for grabs,” and definitely not “ding, dong goes the trolley.” Nor is the betrothal of Miranda to Ferdinand celebrated by having three ladies decked out like The Supremes to sing a lilting Motown-style ballad. Experimentation score: not extreme, but starting to push the envelope. And let’s say a mixed review for how well this kind of business works. I did not care for the tinkering with the language. Thankfully, it stops far short of a wholesale updating of Shakespeare’s lingo. (If you want a laugh, try the No Fear Shakespeare translation of Hamlet’s “To be or not to be” speech.) Also, the best speeches in The Tempest, like Prospero’s “We are such stuff as dreams are made on,” aren’t tampered with. Contrarily, The Supremes (and some other, similar touches) come across as pretty cool. There, you’ve got an entire altered scene that is obviously put in for fun. It doesn’t waffle intermittently with audience expectations, just comes right out and breaks them, and fun it is. Unless you are a Shakespeare purist, in which case you’ve already decided to skip this production. But what about the rest of us? If you do not demand strict adherence to every bit of the Shakespeare canon, will you enjoy Kaminski’s The Tempest? I enjoyed the cool stuff but did not feel strong emotional connection with the characters. I say thumbs-up to the presentation of the play, as Kaminski and the cast and crew at The Public do it, but I wasn’t drawn into the world of the play. It just didn’t engage me the way that many works of live theater do. And—time for a hot take, now—I think the cause of what I’m missing lies in the original. I don’t like The Tempest very much. It has always struck me as a play that’s widely lauded because it has the aura of Shakespeare about it—ah, a late-life masterpiece by the master, so laden with memorable language and meanings—but I’ve never been able to see how it hangs together as a compelling story. There’s little dramatic tension. Prospero has all power. When this wizard toys with the characters shipwrecked on his island, their chances against him are so slim that Vegas wouldn’t offer a betting line. The comical scenes are played superbly at The Public. 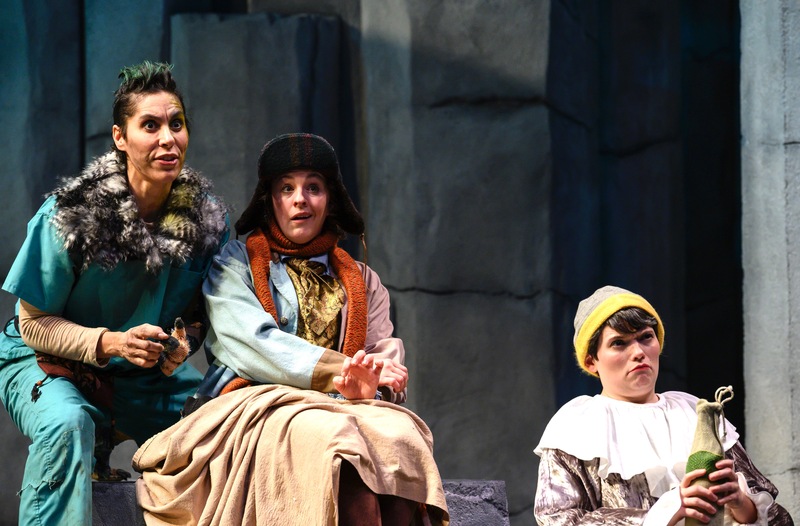 Hats off to Bethany Caputo and Jamie Agnello, as a couple of drunken doofuses from the ship’s crew, who together with Caliban (Shammen McCune) exhibit splendid incompetence when they conspire to take over the island, or maybe the world. Yet, to me, the scenes feel like isolated comedy skits rather than the funny parts that round out a great whole. Enough. Maybe I need to go back to my college Shakespeare class. And maybe you’ll be one of those who love this play for its entirety, not just for certain parts. If so, then please join me in looking forward to what Kaminski and The Public will do next. 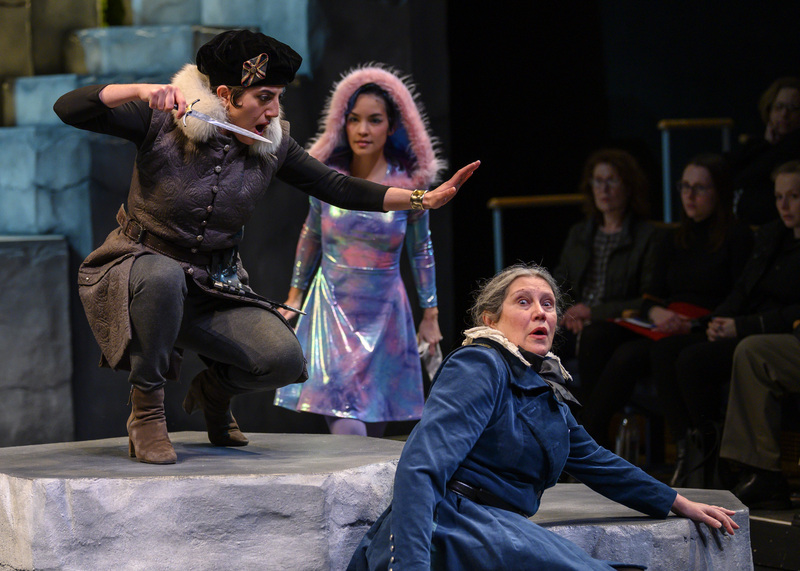 William Shakespeare’s The Tempest, adapted and directed by Marya Sea Kaminski, runs through February 24 at Pittsburgh Public Theater. For showtimes and tickets, visit The Public on the web or call 412-316-1600. At the O’Reilly Theater, 621 Penn Ave., Cultural District. Scenic design is by L.B. Morse, costumes by Nephelie Andonyadis, lighting by Nicole Pearce, sound and original music by Andre Pluess, and choreography by Erika Chong Shuch. Production stage manager is Pamela Brusoski and assistant stage manager, Phill Madore. All photos are by Michael Henninger.